My family and I remember Hurricane Hazel well. 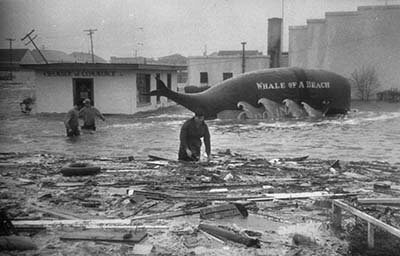 A severe hurricane had not hit the North Carolina coast since the early 1940’s. We had a lot of close calls, but they always veered away or managed to miss us. In October, 1954, when we heard that a hurricane named “Hazel” was headed toward the southern US Coast, no one seemed too concerned – it would turn and go north or out to sea, or so we thought. How very wrong we were. Meteorologists did not have the technology for tracking hurricanes in 1954 as we have now in 1995. Radio and newspapers were our main source of information. There were only a few tv’s. Our local tv station had recently opened and was only on the air about six hours a day. Not everyone had a phone or car either. 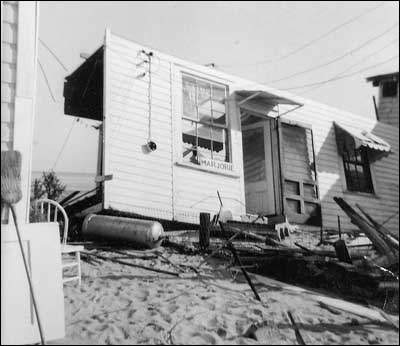 On October 14, 1954, when it was determined that the hurricane was fast approaching the southeastern NC coast, volunteers went door to door notifying residents to evacuate immediately or seek safe shelter. Herman and I lived at 235 Atlanta Avenue, across from the lake and only three blocks from the ocean. Mama and Daddy’s house was at Fourth and Columbia Avenue, also near the lake. Delores and Tiny lived across the street from us. Shirley and Jerry lived in an apartment on Raleigh Avenue. We were all affected in a great way. Mama had stopped by our house about 7 PM to tell us she heard on their tv that the hurricane was headed directly toward us and that people should start to seek safe shelter. Herman just laughed and said he wasn’t worried about it, it would probably miss us, as usual. The wind and rain wasn’t too bad so we went to bed at our usual time. We were awakened about midnight by a volunteer fireman telling us that the hurricane was fast approaching us and residents were urged to evacuate immediately. We dressed very quickly and left with the fireman, we did not have a car. There was no time to pack anything. I was worried about Mama and Daddy, but I was told they had been notified and were leaving. Mama told me later about stopping by our house to get us and the first thing she noticed when she went in was Herman’s pajamas beside the bed where he had stepped out of them rather hurriedly. She always got a chuckle out of that. I was taken to stay with Herman’s mother on Wilson Avenue. He joined the other volunteers in alerting people to evacuate. I slept very little that night. I could not believe winds could be that strong, but that little house remained intact during the entire storm. The hurricane struck on high tide and full moon. The winds were up to 140 miles per hour, but the water caused the greatest damage. When I looked out the window the next morning, the water from the yacht basin was half way up Wilson Avenue. Shirley and a lot of others were staying in the Baptist church not far away. She said the first floor or basement was completely under water. We were able to see the flames from a house that burned down to the water because firemen were unable to get to it due to the deep water. The draw bridge across Snow’s Cut became stuck about 2 AM. No one was able to leave the area then. People took shelter then wherever they could find a safe place. The ocean cut an inlet across Highway 421 to the lake. The sea water went as far back as Fifth Street, one block beyond the school. A lot of people had taken refuge in the school. They had to get on the stage in the auditorium when the water came inside. Some people also stayed on the third floor of Bame’s Hotel. They probably thought it was the safest shelter they could find. They were not able to see much that happened until daybreak. The power and phones were out and few people had transistor radios. We did not know what was happening or how bad it really was until it was over. Mama, Daddy, Delores, Peggy and Brenda had stayed at the train station in Wilmington. Almost everyone was able to get back to the beach soon after the storm had passed. Herman and I went to check on our house late in the afternoon. The water was still waist deep in our yard. Our house was built six feet off the ground on pilings. The water line inside had been three feet deep. The doors had blown open and furniture was turned over. Some of our things had been washed out of the house. The first thing I noticed after we climbed inside was our two cats and our dog, “Bullet,” on the sofa that had turned over. I’m sure they could have told a horrifying tale had they been able to talk. The house and everything in it was a wreck, but at least it was still there. So many houses had washed away completely. Three houses had been swept into the lake and remained there until they were torn down. When we left, with a few muddy clothes and possessions, we each took a cat. When we got outside in deep water both cats went berserk, got away from us and took off swimming. I really did cry then. Herman was laughing and kept saying “Look at ‘em swim, look at ‘em swim”. They came back a few days later after the water went down. “Bullet” didn’t present any problem getting him to the car. Delores and Tiny’s house, across the street, had washed back off the foundation about six feet and was sitting rather lop-sided. (The only two pictures of Hurricane Hazel’s destruction.) Mama and Daddy’s house had 18 inches of water inside but no major damage. The picture albums were kept on the bottom shelf of the closet and most of the pictures were ruined. That is one reason these few pictures on our early years are so precious. The entire beach was devastated. It was the worst sight I have ever seen. It would take an entire book to describe it. As I think on it, I am amazed that there were no casualties or serious injuries. Everyone always had a great respect for hurricanes after “Hazel”. I was six months pregnant with Toni at the time and our few baby clothes were completely ruined. A bassinet and a crib had washed up on our yard and we didn’t have either. Most people, including us, received aid from the Red Cross. The clean-up, repairing and rebuilding took a long, long time, but, eventually, everything got back to normal. That was the first of many hurricanes that I rode out during the fifties and sixties.